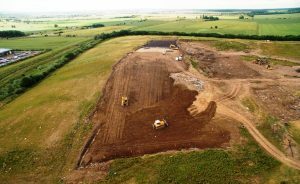 2016 has been another busy year for the engineering department who have carried out Construction Quality Assurance (CQA) on 700,000m2 of landfill engineering on over 40 projects across the UK. Sirius’s Engineers have been responsible for the Construction Quality Assurance (CQA) of over 40 landfill site construction projects in 2016. Working with new and existing clients, our staff have provided services to over 10 waste management operators, on 37 different sites, spread across the UK from Scotland to South Wales. From on-site supervision to design engineering, in 2016 we have provided CQA services to 525,000m2 of capping projects and 172,000m2 of cell construction works.